Sinn Fein has welcomed a decision by the Parades Commission to ban marchers heading to the highly controversial ‘Tour of the North’ march from the Ardoyne interface in north Belfast. For the past two years, serious trouble has erupted over the annual sectarian ‘feeder’ by loyalist organisations through the staunchly republican area. The Parades Commission said a lack of agreement between march organisers and nationalist residents had led to it concluding that “there will be an adverse effect on already fragile community relations and potential tor public disorder” if the parade was allowed passed Ardoyne. The commission said it “must take into account the impact of the policing operation which would have to take place should the parade proceed without restriction”. 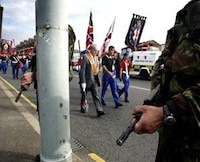 It agreed with nationalist residents that the parade traditionally only passed Ardoyne on alternate years and had not been due to pass the flashpoint interlace in 2010. Loyalists reacted angrily against the ban. Prominent loyalist Tommy Cheevers said “protests could not be ruled out” on the day of the parade, due to take place this Friday, June 18. Mr Cheevers said that his group, which includes the unionist paramilitary UVF and UDA, as well as the loyalist marching orders, would not decide on what form of action it would take until Wednesday, 48 hours before the Tour of the North is due to take place. Sinn Fein’s Gerry Kelly said local residents had made it clear that they wanted to engage in dialogue from last October but loyalists had been unwilling to engage in talks until late last week. “I hope this decision acts as an incentive for all sides to reengege in dialogue,” he said. Despite the commission’s decision, tension continued to mount in Ardyone ahead of the parade following raids by the PSNI and the arrest of an Ardoyne man earlier today. The Greater Ardoyne Residents Collective (GARC) did not comment on the determination or the raids, but said local residents had been treated as “second-class citizens” by the Parades Commission in recent years by “allowing drunk and drug-fuelled loyalist paramilitary flag-waving thugs to pass our area, reminding us of not only their past deeds but what their future holds for us”. It said the violence of July 2009 was “inevitable” following the use of the PSNI to force the parade through where it was “clearly not welcome”. It pointed to a recent disclosure that cost of policing last year’s parade was over 650,000 pounds, but “the cost to our community was even higher with three days of violence, police raids, fear and restriction on resident’s movements”.